Standing in the East Garage parking lot, with your back to the entrance on Main Street, walk all the way to the back of the lot and around Building 66 to the left. 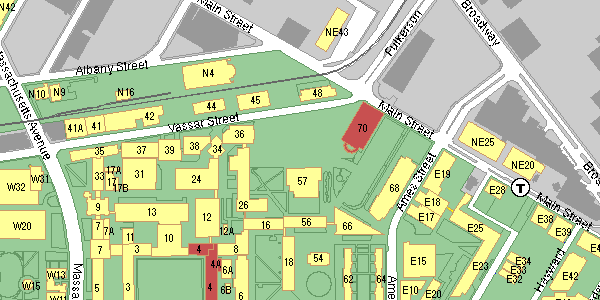 Turn right at the back of Building 66 and follow the path all the way to the entrance to Building 56; the various doors before that are most likely locked and unuseable without an MIT student keycard. Enter the door into Building 56. Follow the corridor to the left, and continue all the way to the end. Turn left, then go up the stairs and through the short hall, and you come to the Infinite Corridor. Make a right turn into the Infinite Corridor and follow it a short distance to Building 4, on the left. When you find Building 4, go up the stairs to the second floor and follow the corridor to the right. Room 231 is the first door on your left.